Blockchain is a hit in today’s world of new technologies. It has been changing the world for several years, and according to many analysts, blockchain-based solutions can significantly affect not only the world of technology but also financial institutions, states and policies. So, what is the technology that is meant to change the world? How does it work? The blockchain was used for the first time in 2009 when bitcoin crypto-currency was launched. Bitcoin’s value is based on computing power, and not on the cold standard or national and international regulations. Today its value exceeds five ounces of gold and it just broke the $ 7,000 barrier for one bitcoin. I can explain this dynamic using a popular example on the Internet. Seven years ago two pizzas cost 10 thousand bitcoins, which was less than $ 20. If the owner of the pizzeria, who was then paid in crypto-currency, would not have spent that money, today his account would hold … about 72 million dollars. Blockchain makes it possible for other crypto-currencies to evolve. This technology has the potential to become the foundation for further innovative solutions in the future. Then, what is the blockchain for bitcoin? Blockchain (as defined by bitcoin.org) is a chain of blocks with each block referencing the block that preceded it. It basically means that all bitcoin transactions are saved in a chain in a chronological order and are public, and it is shared among all Bitcoin users. 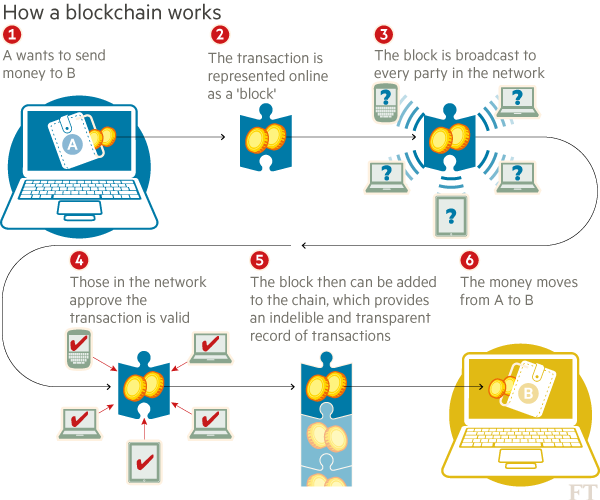 According to literal translation (blocks – chain), information blocks are connected into a chain in which each successive item depends on the previous one. Blockchain allows anyone to “own” the entire system database, thereby creating a dispersed and decentralized registry. Thanks to this data registry, it is impossible to modify data, delete or add any false information. This technology excludes the existence of any central authority to change or update the chain, as the current version of the database is scattered all over the world. Looking at it from this perspective, I can compare blockchain to the world famous Wikipedia. We all have easy access to it, and every little bit of modification remains – except that the “blockchain” administrators are all its users. We know exactly who, when, and how modified the content on each page. The whole power of the system lies in our trust in the technology, which powers it. Moreover, this is not a secret algorithm stored somewhere in strictly guarded US or Israeli server rooms, but a fully open source code that can be analyzed and verified by anyone who has knowledge of software development. Based on the blockchain, you can create different types of registries, such as stock market transactions or medical events at the hospital. However, the question is whether this technology is advanced and secure enough to process such sensitive and important data. The basic feature of blockchain is “non-repudiation of the information” – in practice, this means that the once saved it, the information remains unchanged forever and any previously entered one cannot be deleted or falsified. Why is that so? Thanks to the fact that new event messages are sent simultaneously to all users in the system. It is necessary for the users to adapt to certain rules resulting from dynamically changing conditions in the system. Any new information in the registry must be encrypted using a key pair (Public and Private Key). This system is based on signatures – encrypted keys – which are much safer than the handwritten ones (eg on contract or credit card payment). The public key is like a recipient’s mailing address and is used to encrypt the information, while the private key (secret key) is used to authorize messages to be sent, as well as to be read by the recipient’s (it can be compared to a mailbox key). The account security depends primarily on whether the user can securely store the private key assigned to him. Note that “losing” this key is irreversible – for both the user and all third parties except the “key finder” – which basically leads to loss of control over the account. This signature is unique to each dataset because it is based on the sender, the content, and the time of the event. The encrypted information must be sent in an appropriate format and be verifiable. Verification does not take place at the bank or notary, as any user of a blockchain-based system can validate at any time any change in the system. This leads to full decentralization, which prevents individual registers (system administrators, lawyers) or organizations (banks, financial institutions, states) from controlling the registers. Moreover, at the time of the update, information is distributed, available for inspection and verification to every participant in the system. The information from the registry is public and available for all users. Instead of the name of the holder, there is only an identification number that looks like a random string of characters generated by a cat passing through the keyboard. So, how it happens that the data is being updated in so many places in the same time and the whole system is still synchronized and not going crazy. It works like in any democratic system – by means of “universal elections”. All machines “vote” on the database version, which in their “opinion” is their most up-to-date and reliable. Based on such automatic arrangements, in which there is no possibility of cheating the system, a suitable reference database for the next calculation is selected. Hundreds of thousands of this kind of operations can be performed just in a minute. Moreover, the information does not need to be exchanged between people but can be sent by machines, such as smart home appliances connected to the network, which create the Internet of Things (IoT) ecosystem. When I look at the blockchain use solely in finances, we can talk about a revolutionary solution that seriously threatened the existing status quo in the economy. Increasing importance of the blockchain may redefine the notion of trust that has so far been based on the authority of the institution and will now be based on the strength of the cryptographic algorithm used in the system. It is difficult to determine whether hyperoptimistic sentiments associated with the development of blockchain will be confirmed in the future. There is no doubt, though, that while this technology has grown on the developers ground all over the world, it is becoming increasingly popular with large corporations and states governments. Today developers are in the vanguard of this technology development. Will their talents, knowledge, and experience be used for the country and for the benefit of the citizens? This is a topic for another article. This entry was posted in General, IT and tagged 2017, 2018, 4G, 4G coverage, administration, ai, akamai, algorithms, algorytm, algorytmy, Alibaba, Aliexpress, AlphaGo, AlphaGo Zero, amazon cloudfront, amazon webservices, AMD, America, android, antivirus, antiviruses, applications, artificial intelligence, atlantic, aurora, automobile, bandwidth, beginner, big data, bigdata, bigthing, bing, bitcoin, bitcoin mining, bitcoins, block chain, blockchain, boost, boost your website, boot, booting, BTC, bug, calbe, car, careful, cars, cash, cdn, centrum danych, chart, China, cloud, cloud-based firewall, cloudflqre, colocation, company, comparaison, comparing, compartive, computer, computers, computing, confusing, congused, connection, Content Delivery Network, cryptocurrency, CSO50, cybercrime, cyberspace, cyberwar, dane, Data, data center, data storage, database, Datacenter, DC, dead, dedicated, dedicated servers, deep thinking, deeplearning, deepthinking, defence, die, difference, digital, display, DNS, driverless car, e-commerce, ecology, Ehost IDC, ehost international data center, Ehost Internet Data Center, ehostidc, EhotIDC, Europe, experiment, FACEBOOK, failure, fast, fastest, fiber, finland, Firewall, Ford, forecast, France, game, gamer, gaming, geek, Germany, Go, going green, goodle, google, google search, gracze, groth, gry, hacker, hackers, hacking, happiness, hardware, hebergement de donnes, hi-tech, history, hitech, hola cdn, host, host-based firewall, hosting, hybrid cloud, IDC, india, Indonesia, innovation, inphography, Intel, interesting, internet, Internet of things, invention, IoT, IP, iPhone, iPhone X, IPv4, IPv6, isp, IT, Jack Ma, Japan, jaywalking, job, kaspersky, kernel, keyboard, keyboards, kim jong un, KIM JONGUN, kimjongun, knowledge, Korea, korean data center, krack attack, krackvirus, laptop, letancy, linux, list, LTE, Ma Yun, machie learning, machine learning, machines, Malaysia, malware, managed, MAREA, market, marketingautomation, Mb / s, middle east, mining, money, monitor, monitors, monitory, MySQL, NEC, nerd, net, network, network-based firewall, networking, nety, new data center, news, no net, node, nonet, north korea, northkorea, Norway, NSA, numbers, ocean, omg, Operating system, OS, outage, ovh, perception, ping, planetsimon, plans, Poland, price, problem, process, processor, processors, protection, pyongyang, rack, raport, review, rich, rifle, rip, robot, Robotics, Robots, Russia, russians, science, screen, search, search engines, security, security solutions, secutiry solutions, self-driving car, seoul, server, servers, serveurs, serveurs dedies, smartphone, sophia, South Korea, speed, spy, spying, srash, srever hosting, stealing, stocks, stolck, subsea cable, supercomputer, system, Taiwan, tech, technology, techy, test, Thailand, the fastest computer, top, top500, traffic, trick, turtle, turtles, Uber, UK, under water, US, USA, user, vehicle, video, virtual money, virtual private network, virus, Volvo, VPS, vs, WAF, Waymo, web, web page, webpage, website, wifi, windows, windows phone, windowsphone, wow, youtube, youyube. Bookmark the permalink.